Fr. Bob was born and grew up in San Francisco, in the Diocese of California. After a background in electronics engineering and in physics research, he received degrees in the Philosophy of Religion and Social Psychology in Northern California and his theological degree from Nashotah Theological Seminary in Wisconsin. 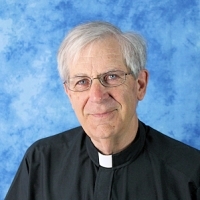 Ordained Deacon in 1970 and Priest in 1971, he served as Director of St. Dorothy's Retreat & Conference Center in the Diocese of California, Associate Pastor at St.Matthew's Church in San Mateo, at St. Paul's Church in Oakland, and on the staff of La Casa de Maria Conference Center in Santa Barbara. He and Margi were wed in 1975 while they were on the staff of La Casa de Maria Conference Center in Santa Barbara, after which he served the Diocese of Honduras as Director of El Hogar Ministries and Rector of St. Mary of the Angels in Tegucigalpa. Fr. Bob was Assistant Rector of St. John's-by-the-Campus in Ames in the Diocese of Iowa; and then Rector of St. James-on-the-Parkway in Minneapolis; Priest-in-Charge of St. Matthew's in Minneapolis, Hispanic Missioner at Christ Church in Albert Lea, and Priest-in-Charge at El Santo Niño Jésus in St. Paul. He retired as Priest-in-Charge at Trinity Church in Litchfield in the Diocese of Minnesota and moved with Margi to Venice, Florida in 2008, where he was assigned by the Bishop of SW Florida to assist at the Church of the Good Shepherd. During his active ministry Fr. Bob served dioceses as member of the Standing Committee, the AIDS Commission, and as Ecumenical Officer. In addition, for five years he worked with the Deaf-Blind community in Minnesota and trained in Servant Ministry with Bp. Bennett Sims at the Seminary of the Southwest in Austin and at the Urban Training Center for Christian Mission in Chicago. He is author of several books and liturgical materials for use with families and children. He is a Priest Associate of the Community of the Transfiguration in Cincinnati and is a member of the ecumenical Immaculate Heart Community centered in Los Angeles.